We place crowns and bridges as a lasting replacement for damaged, discoloured, chipped or cracked teeth. We also correct the outer shape and position of the tooth with these dental pieces. The crowns and bridges that our specialized team makes cannot be distinguished from real teeth – they closely emulate the original shape, function and colour of your original teeth. A crown is the perfect solution for a discoloured, chipped, cracked or otherwise damaged tooth. We compare a crown to a cap that fits precisely over a filed-down tooth. Our crowns are made of porcelain or a combination of porcelain and metal. We fasten the crown to the piece with glue or cement. We place a bridge when one or more teeth are missing. The bridge ‘bridges’ the empty space left by the missing tooth. A bridge consists of various pieces next to each other. We fasten the bridge to existing teeth on either side of the open space. Step 1: Preparing your tooth During the first consultation, your tooth is prepared. In this way we create enough space for placing the crown or bridge. Because preparing can be an unpleasant experience, we will numb the area to be treated. Step 2: Taking a dental impression The dentist will then take a dental impression during this first consultation. The crown or bridge will be crafted by the dental laboratory after that. We can also make a crown or bridge with a 3D picture and design using our CEREC technology. Step 3: Occlusion assessmentThe dentist uses an occlusion assessment to analyse the state of the teeth in the upper and lower jaw. This allows us to determine the height of the crown or bridge and the shape of the chewing surface and cutting edge. Step 4: Defining the colourUsing a colour scheme, you decide in conjunction with the dentist which colour of crown or bridge is appropriate for you. If the colour turns out to be different when placing, it can still be modified by the dental technician. Step 5: Placing the temporary crown or bridgeDuring this first consultation we place a temporary crown or bridge on the filed-down tooth. This is for your comfort and to protect the tooth. This temporary crown will remain in place until the tailor-made crown or bridge is ready. Step 6: Placing the crown or bridgebridge During the last consultation, the temporary crown or bridge is removed and the dentist places the crown or bridge in your mouth and fixes it in place. We apply quick-setting cement to the inside of the crown or bridge and then place the crown or bridge in the right place. If the tooth does not provide enough support to secure the crown or bridge, it is important that the dentist first makes a strong core restoration. The core restoration is fixed to the root canal with a post. Then we can fasten the crown or bridge on it. CEREC technology is used by the dentist to prepare a good replacement for your tooth. First, he files your tooth into the right shape. If a tooth is missing, then he will file down the teeth on either side of the empty space. In this way it will be easy to place a bridge. Once he has finished filing, your dentist scans your mouth to obtain a perfect 3D image of your teeth on the computer without taking a plaster impression. You then discuss the situation and the treatment plan with the dentist. This technology also allows you to view the expected result immediately. In addition, the computer calculates the shape of the crown. In conjunction with the dentist you define the colour of the crown or bridge. The dentist then places the material for the crown or bridge in a milling machine. This machine mills the piece into the right shape. The process lasts about 15 minutes. During the same consultation, as soon as the crown is ready, the dentist places it in your mouth. If your tooth is missing or is too damaged to be useful as foundation for placing a crown or bridge, we will first place an implant. An implant can be compared to an artificial root in the form of a screw that we attach to your jaw. Afterwards we can place the crown over it. An implant is made of biocompatible material. This ensures that your body will not reject it and that the bone will grow onto the implant. After placing an implant, the process follows the same steps as described above. We cannot place a crown over an implant with CEREC technology. The fees have been established by the Dutch Healthcare Authority (NZa). You will find a complete overview of the costs on our price list. A porcelain crown or bridge looks natural because the material is the same colour as the tooth. We therefore use porcelain crowns and bridges in many situations. The chance of the porcelain crown or bridge breaking is lower than it used to be due to new techniques. The E-max and feldspar porcelain options are available. These types of crowns and bridges have a metal base. A layer of tooth-coloured porcelain is applied over the visible part for a more natural appearance. A zirconium crown or bridge is metal-free and has a ceramic core with a thin layer of porcelain. Zirconium crowns are very strong and adhere to the gums in a natural way. Thus there is less chance of gingivitis. You can also opt for a gold-ceramic crown. A gold alloy is used as base material here. We then apply tooth-coloured ceramic over the visible part of the gold alloy. We apply this in various layers until the right colour is obtained. The traditional bridge is placed on either side of the empty space. The bridge is attached to one side of the missing tooth. We often use a resin-bonded bridge for missing front teeth and when the adjacent teeth are still undamaged. Because it is a pity to file down these teeth, we bond the bridge to the back of the adjacent teeth. How long does a crown or bridge last? The types of materials we use to craft a crown or bridge are so durable that the pieces last for at least ten years. 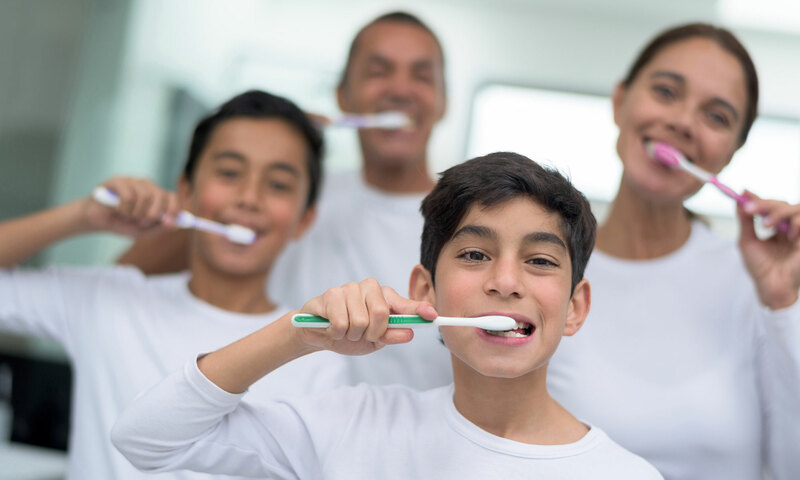 You can extend this period yourself by ensuring proper oral hygiene. After we have placed a crown or a bridge, the treated area can sometimes remain sensitive. This afterpain usually disappears after about a week. Contact us if you have pain for longer than this. How can I best maintain my crowns and bridges? For proper maintenance of your crowns and bridges, it is important to have excellent oral hygiene. Clean the gums around the crown or bridge carefully with a soft toothbrush. Use toothpicks, interdental brushes or dental floss every day as well. Consult our dental hygienistfor more advice on oral hygiene. If you would like more information on crowns and bridges or would like to schedule a consultation straight away, call 020 618 0074 and we will be pleased to schedule an appointment for you at short notice.